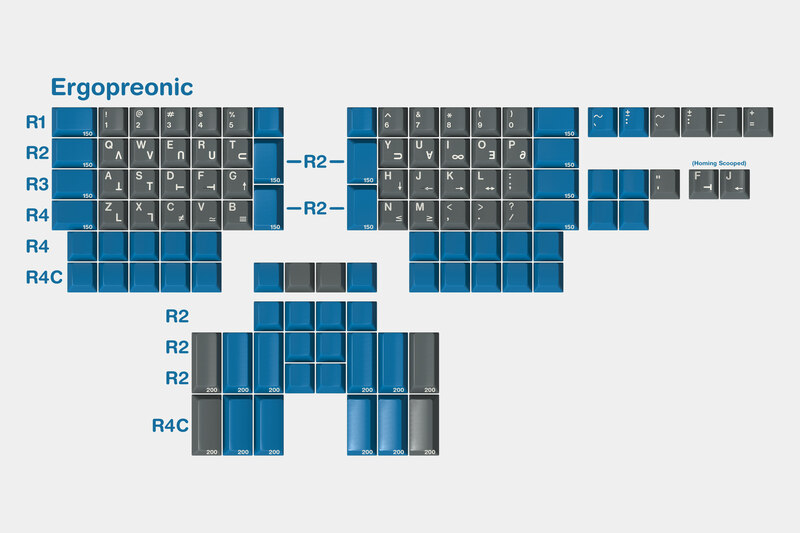 Here's the original, Symbolic's 'Space Cadet' keyboard. - thanks to Chyrosran22 for supplying high resolution photos of the board he had temporarily for his video. - t0mb3ry assisted me by creating vector work for the unique APL symbols, as well as further fine tuning the hand icons and roman numerals for the Symbols kit. All renders now feature these custom legends. 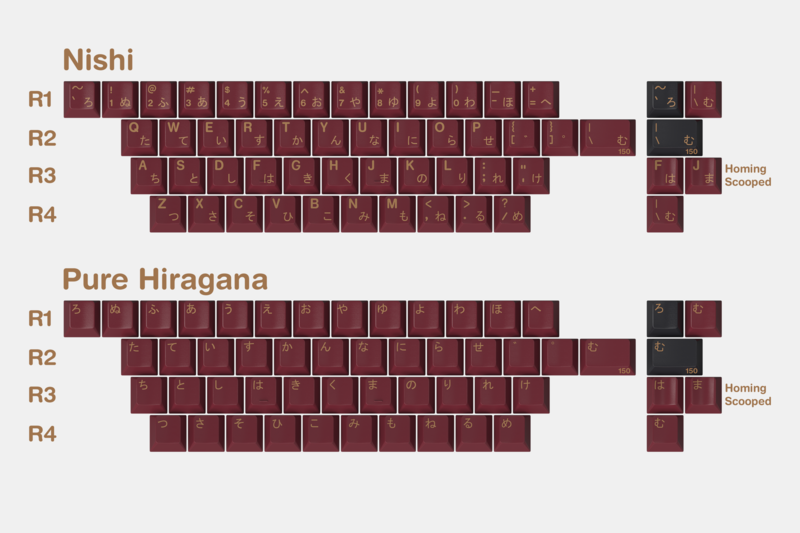 - I have further optimized the coverage of the base kit, it currently covers WK, WKL, Fullsize, 96key, 1800, CP, 60%, 65%, 75%, HHKB-style, the C70, 60% with arrows, and a few more I can't think of right now. - I removed Cadet specific alpha keys from the base kit to cut down cost, and I believe not many people would have ended up making good use of them anyways. I now have standard US-ANSI alphas with two extra pipe keys for physical ISO support. - I removed Gray keys from the Symbols kit. Instead I increased layout support, such as vertical macro/function rows on VE.A/TC-V3/RedScarf II. 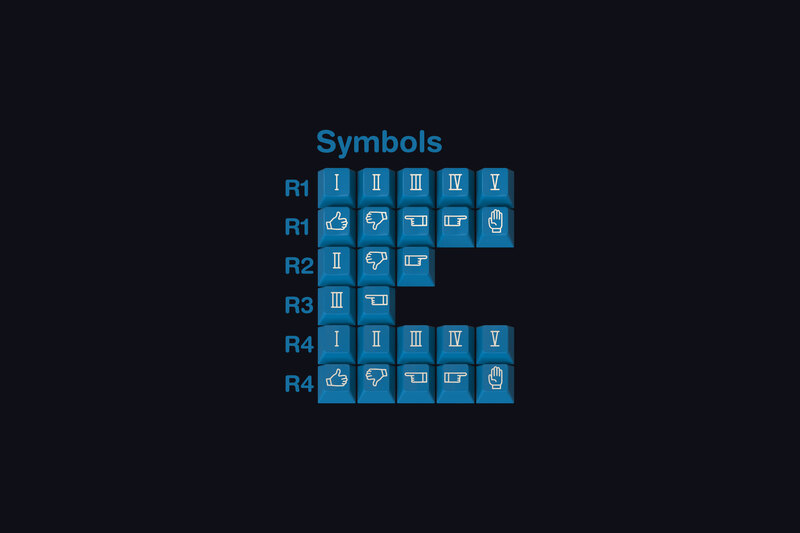 - I removed Community keys from the Symbols kit. There seems to be a lack of interest in these nowadays anyways. 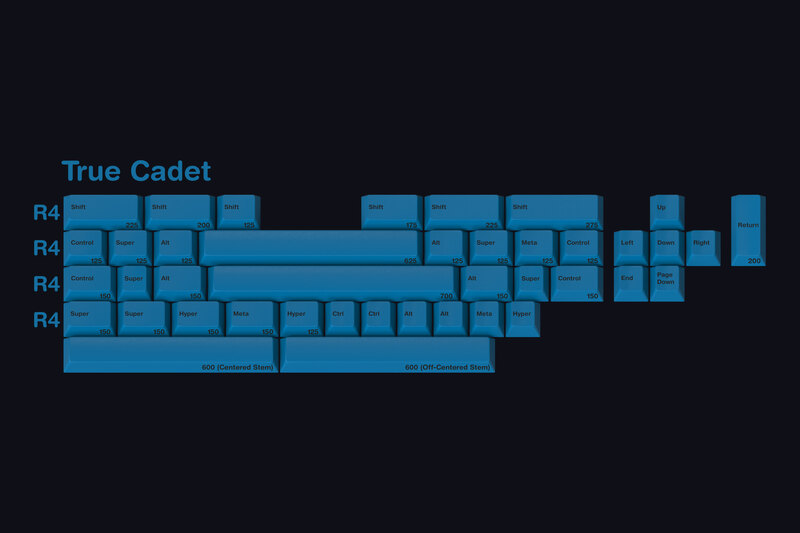 - I added blue spacebars to the Black Modifiers, and renamed the kit to True Cadet. - I added a Cherry Icon kit for those that dislike the text-only modifiers I chose for the base kit. 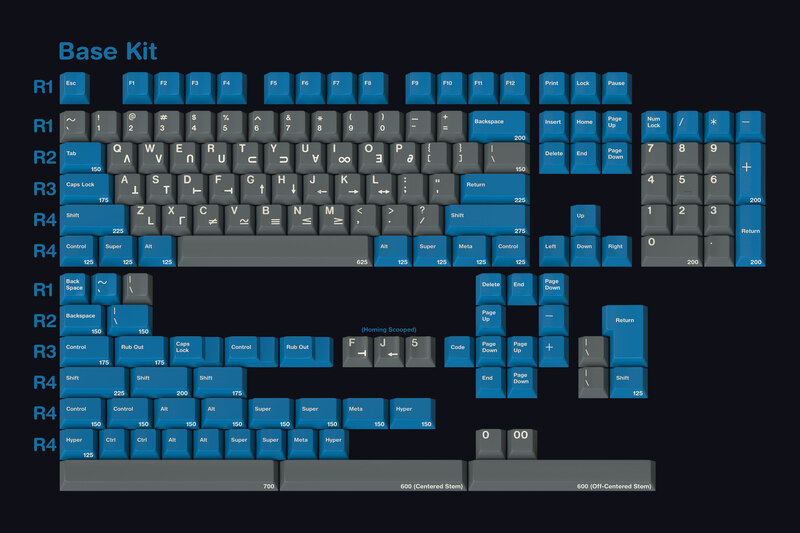 I did not go for Icon+Text (the 'standard' GMK legends used on Carbon/Laser/Nautilus etc) as I felt they didn't change too much about the look. 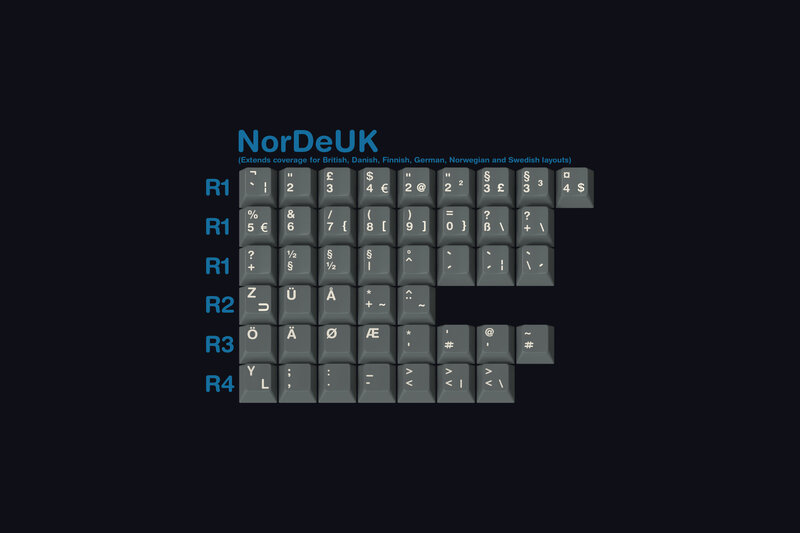 Instead I went for the style of old Cherry keyboards such as the G80-1800 where the center part uses icons only, while top and bottom row remain text only. 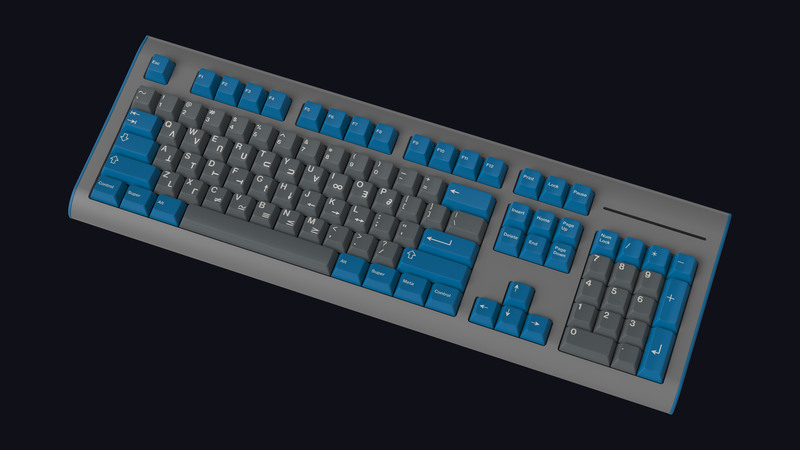 GMK Muted is a set that used this style for example, and I have demonstrated this in some of the renders. 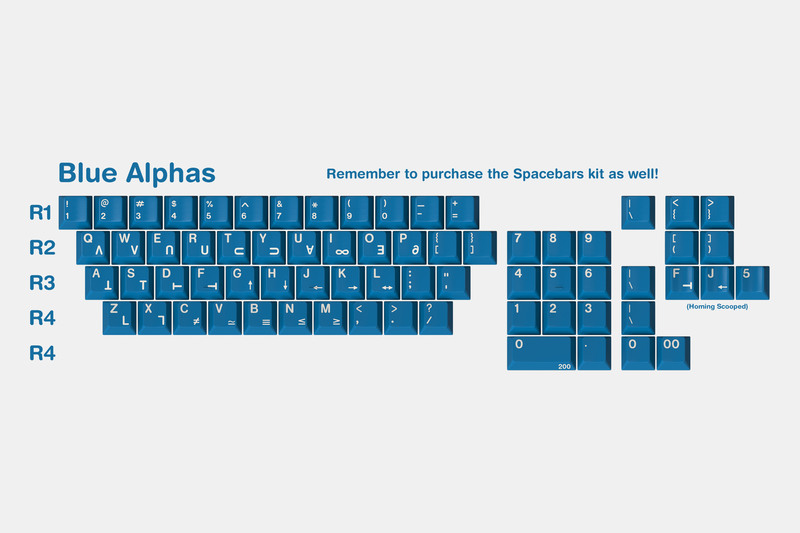 - I added blue spacebars to the Blue Alphas kit. 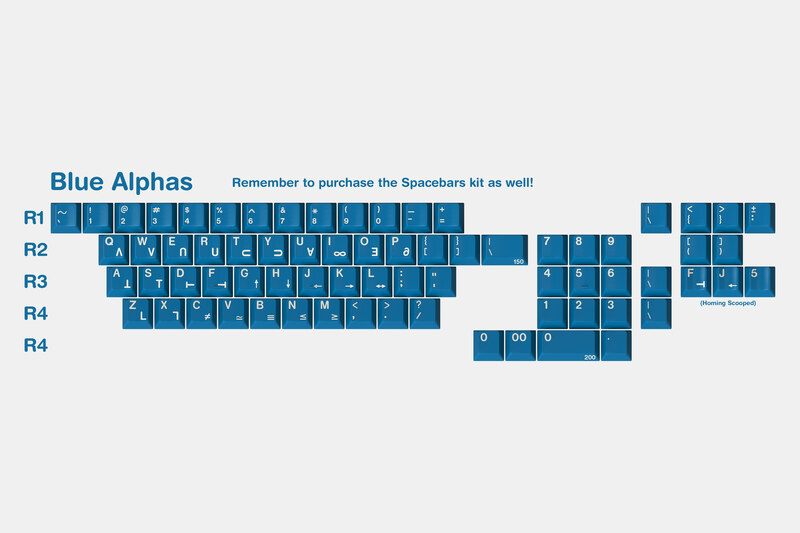 - I removed blue spacebars from the Spacebars and -Keys kit, which is now a Spacekeys kit only. 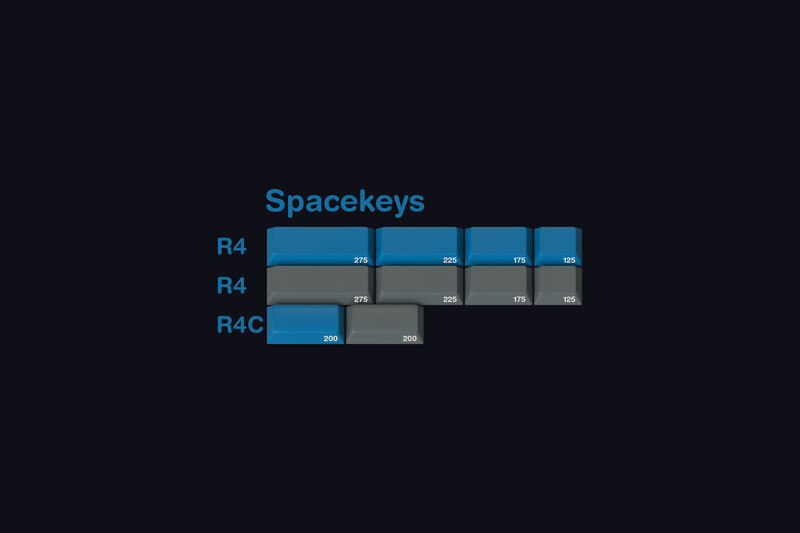 -- The addition of blue spacebars to True Cadet and Blue Alphas now ensures nobody needing them forgets to purchase them, and it cuts the number of kits you need to buy from 3 down to 2, which saves about 15-20$ in a GMK buy in 'kit split taxes'. - I am introducing the Assembly Kit, which is a kit independent from the Base Kit that fully covers the Ergodox keyboard. 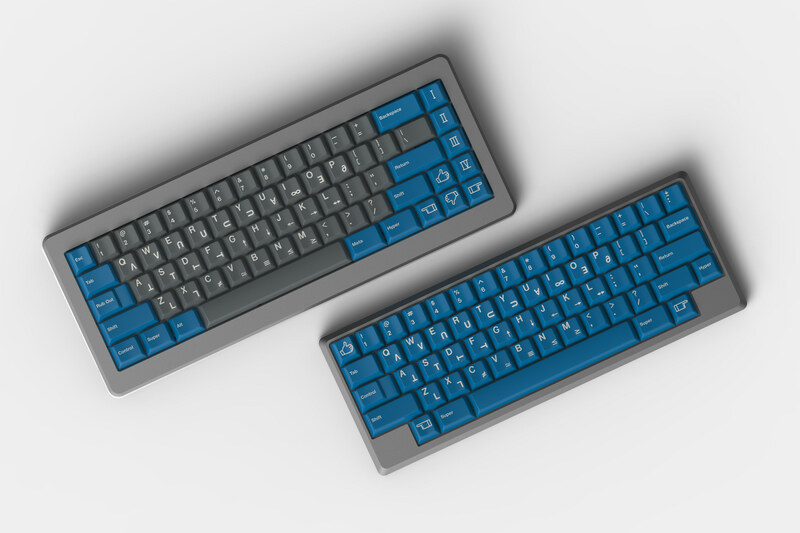 - I am also introducing the 40bit Kit, which is also independent from the Base Kit and covers Planck, Preonic and a variety of 40% keyboards. -- Both these kits have brand new ASM inspired modifier legends. I mocked up a blank modifier version for both, but with the busy Cadet alphas in the center it looked very imbalanced. These kits will not be cheap, probably more expensive than the base kit as they will hit way lower MOQ's (100 for both would be a big success already) while the base kit will most likely hit 500 units, and hopefully also 1000. So please keep in mind that you are probably going to be paying the price of a kit that is only produced a hundred times, but I think it is very much worth the extra cost for the modifier legends, and I hope many of you agree. 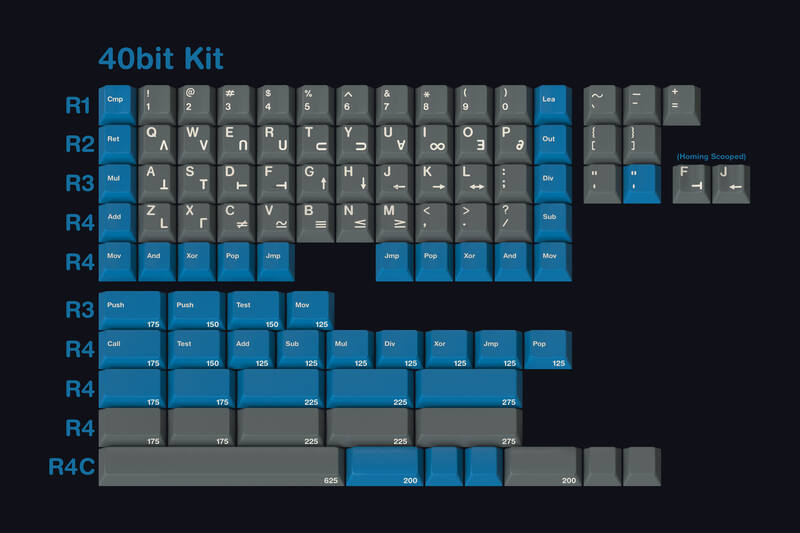 I will then also be able to use these legends in GMK Oblivion V2 next year. 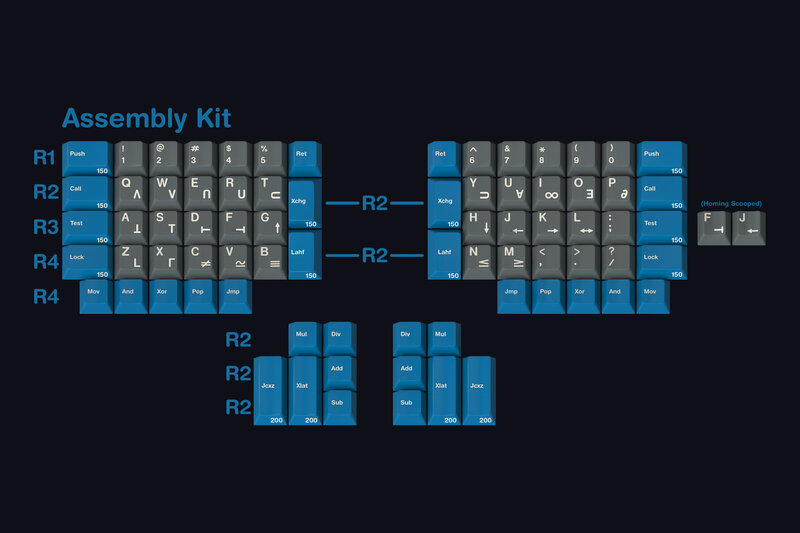 And again, the base kit is NOT required, all you need is either the Assembly or the 40bit kit for your special layout, and I've seen people shell out 180-200$ in previous GMK runs where Ergodox modifiers had to be purchased in addition to the base set. - Colevrak kit will not be offered. It would be 99$ due to even more custom legends, more keys than usual Colevrak kits, and have an MOQ of 100. 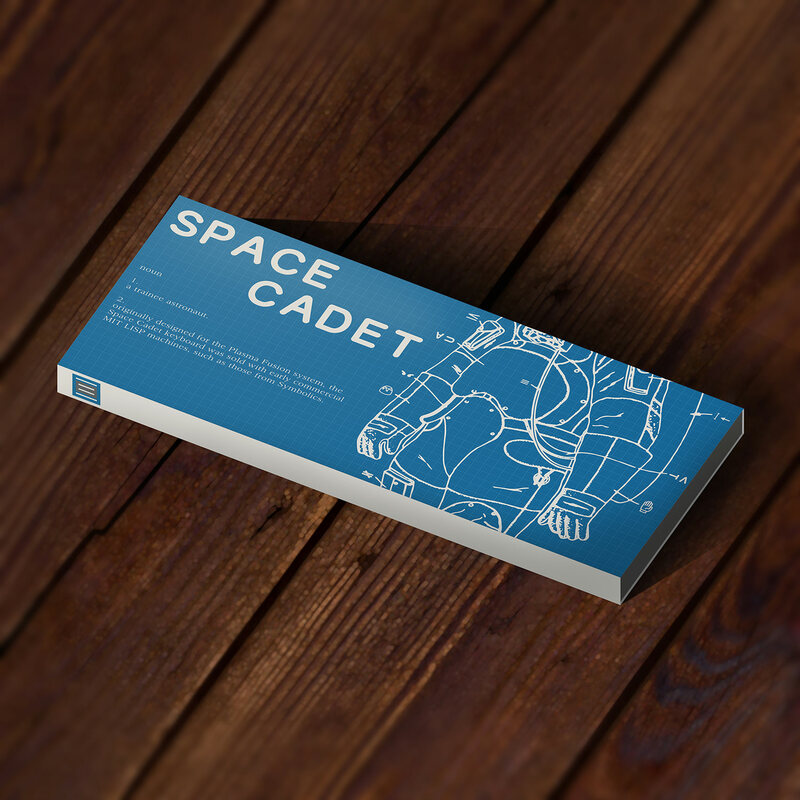 Lastly, the excellent outragedpudding has created a packaging design for the GMK trays. The Assembly and 40bit kits will probably also be coming in trays, but this is TBD. Please enjoy the renders, and let me know if you have any questions or feedback! I already received pricing for all the kits apart from the Assembly and 40bit kits (I had those layouts covered in a bigger single kit, but the price was not viable). While I can not reveal pricing for the other kits at this point, I can however assure you that you will be very pleased with the 1000 unit price point of the Base Kit. 40% and Ergodox renders will follow once I have the pricing for those and am certain these will be offered. PS: There will be a couple collaborations with other products for the sets, stay tuned. I recently built my own 'end game' keyboard with 7bit's Round 6 caps, when I decided it was time to bring this classic colorway to the realm of cherry keycaps. I've already drawn up the kits I would like to see in the group buy for this set, but these are of course not final. There are still a few question marks to deal with. 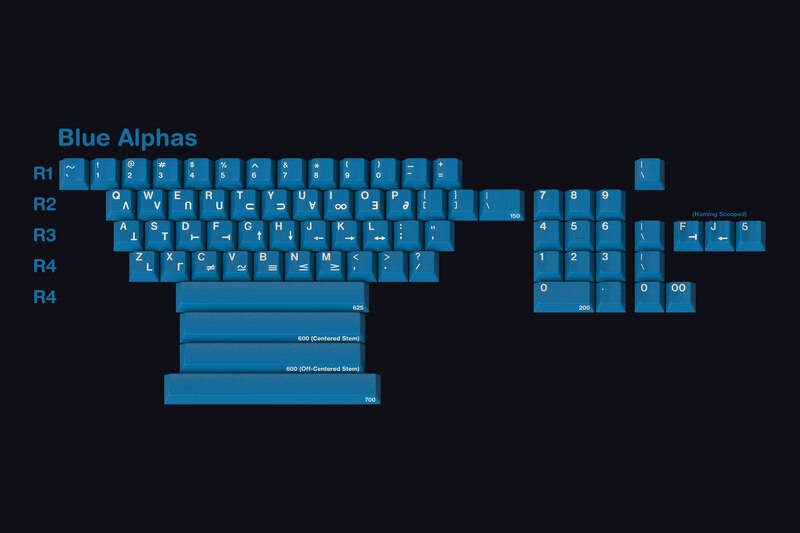 It was important to me that the original keyboard can be replicated closely, hence the extra alpha keys, Black Text Modifiers kit and having blue spacebars available separately instead of putting those into the Blue Alphas kit to not make a purchase of them mandatory. A: Massdrop. I know this will result in uproar from some of you, but a GB like this is just not be doable otherwise. There are certainly vendors that have grown over the past year to a level where they can easily carry a base kit with a few addons, but this is 7 different kits of which I would call none dead weight. 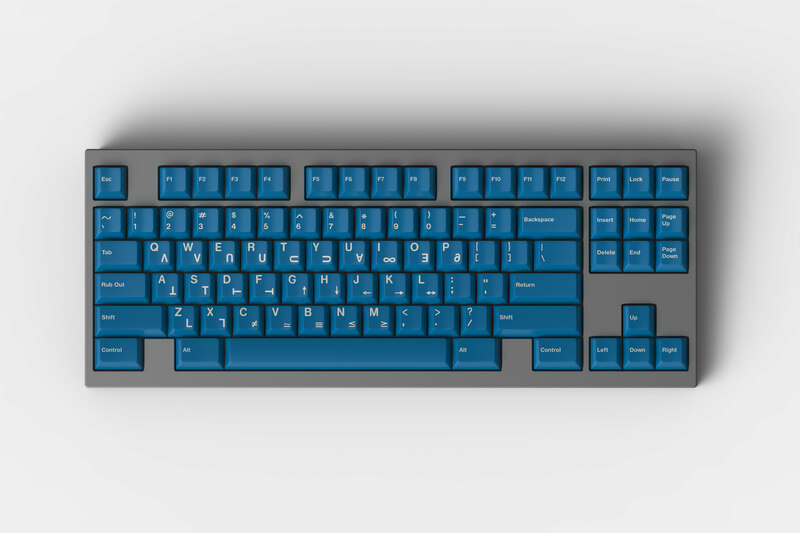 Coupled with the fact that this set requires A LOT of custom molds, a reach like Massdrop's is vital to make this pass all MOQ's. A: Yes, everything. New molds for alphas etc, no half-assing on my watch. A: Due to the secondary APL legends, a Colevrak kit would need 20+ new molds made as well. With Colevrak kits having an MOQ of 100 and only ever having reached that number once with Laser, we're talking about a 30euro (40-45$ or so) extra, making the kit cost 80-90$. A: I'm not quite sure yet how to add 40% support to this set. I don't want to add that many keys to the base kit which already will be costing more than regular. Maybe a separate kit could be realistic. A: This was exactly what Bob Ross meant by his famous saying "We don't make mistakes, just happy little accidents.". 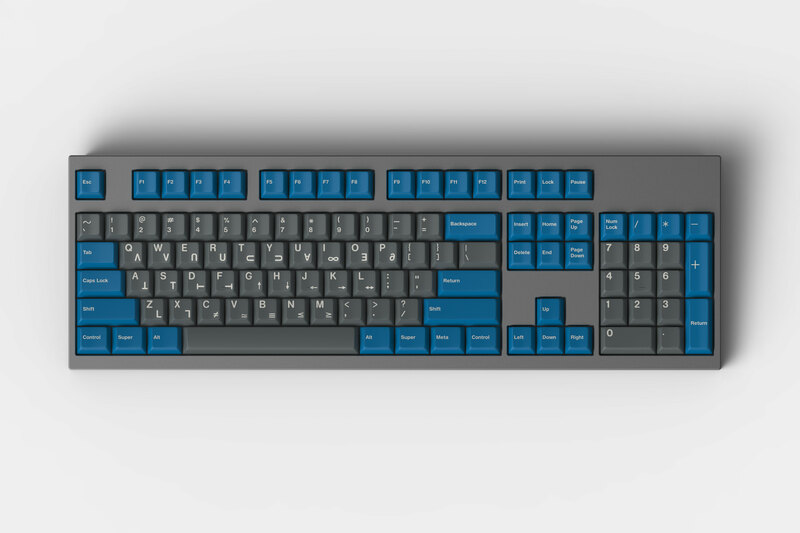 I always start my renders with one color for all keys, apply the legends and then split off the alphas/accents etc to change their color. 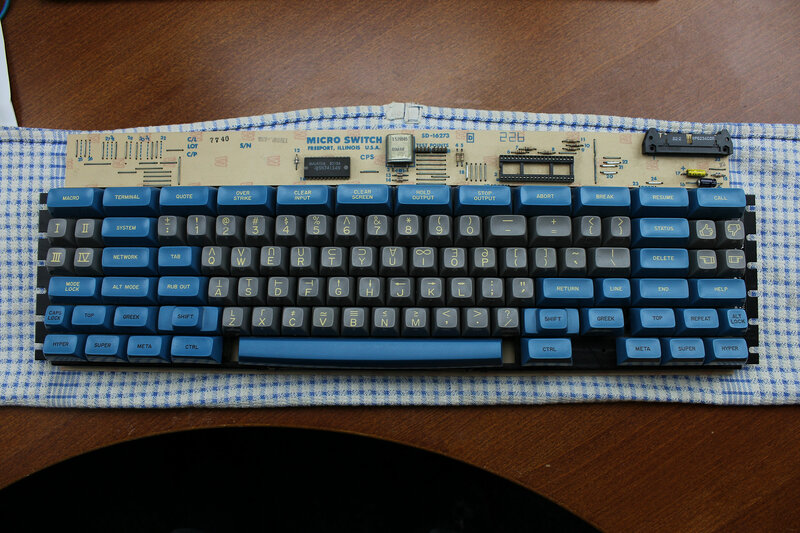 So when I saw the entire keyboard in blue, I knew I have to have it. A: Blue alphas are the icing of this cake, getting the gray kit to pass MOQ will be struggle enough. 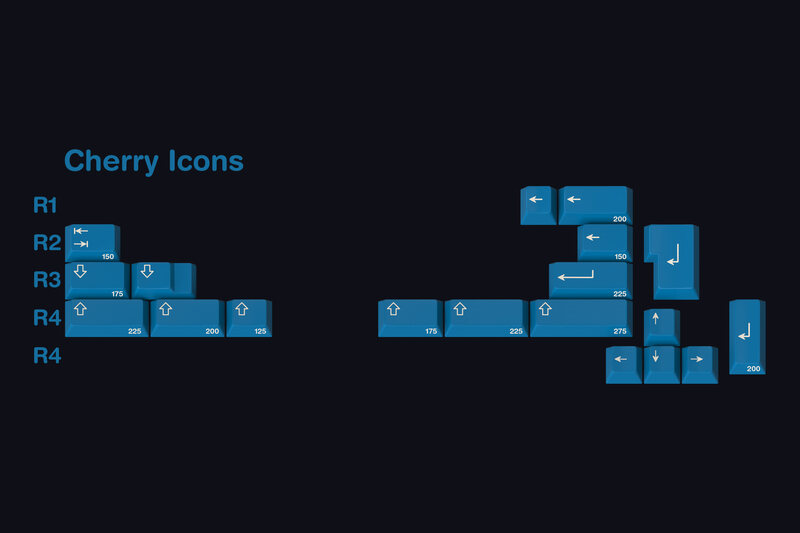 A: I'm trying to stick to the design of the original where possible, so using Cherry arrows for Tab/Backspace/Return/Shift keys did not seem appropriate to me. Nobody I showed this to even mentioned that those were missing so it appears people like how this looks. I hope you agree! EDIT: Due to popular demand, I will look into how I can offer Cherry-style Icon+Text mods as well. I have various ideas on how it could be done, I will investigate how it plays out with pricing. But since this is still a very young IC, don't expect an answer in the coming week or so, just note that I have heard you and will pursue options. 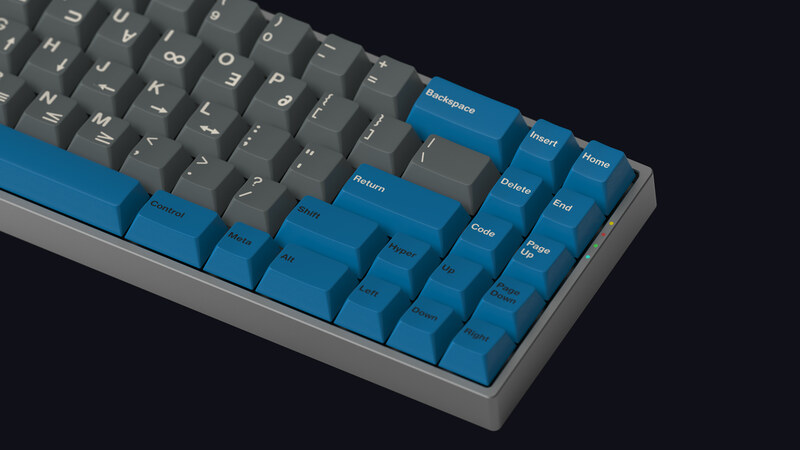 A: Custom, I'll have GMK color match BFP from Signature Plastics for the blue keys, Gray is closest to GD which I had them mix already for GMK Oblivion alphas so I'll probably be reusing that as well. Legends are TBD, probably N9 (near black) and CP (off-white). A: I can't say for sure, but let's do some napkin math. GMK Red Samurai Base Kit has 164 keys, this has 162 keys, so the price of the keys themselves would practically be identical. However we have 36 new molds that need to be made, each costing 150€, a total of 5,400€/6600$. 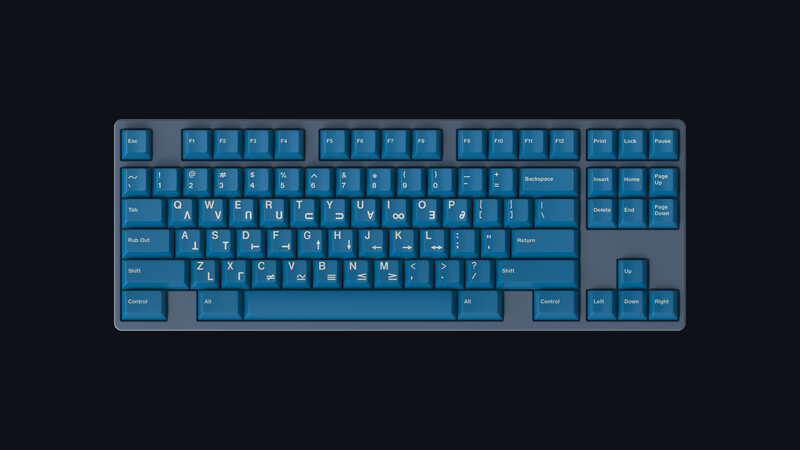 So if we took the prices from GMK Red Samurai that's on Massdrop right now and added this cost we end up with 500:143$/1000:127$/1500:115$. But again, napkin math. 500:149$/1000:129$/1500:119$ is a good guess though IMO. 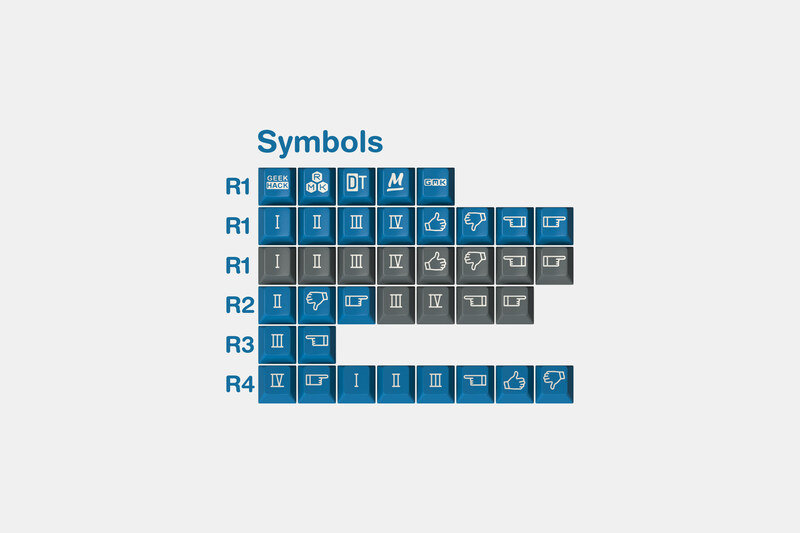 Special thanks to t0mb3ry for turning the Symbols (roman numerals and hand signals for the Symbols kit) into vector format and Chyrosran22 for supplying high resolution photos to work off of! PS: Support the project by adding a banner to your forum profile! Really a must have set in my opinion. I really appreciate it! Any chance of adding Frow alternate color? 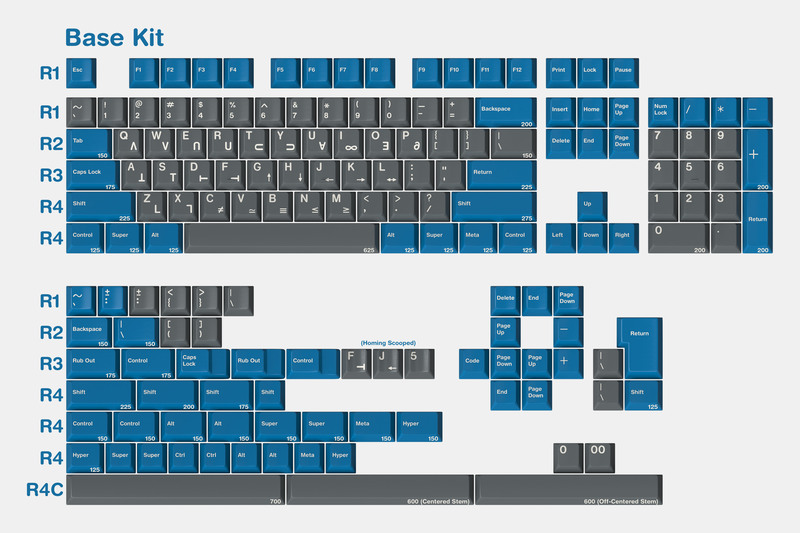 Sandwich mod colors should never have been a thing to begin with (I regret making it default on SA Oblivion and the only option on GMK Oblivion) On a set like this, having it full mod color is of high importance, I'm not quite sure how to add 12 gray F keys on a GMK GB, in base it would add 15$, separately it would cost 20$ and probably not make MOQ. 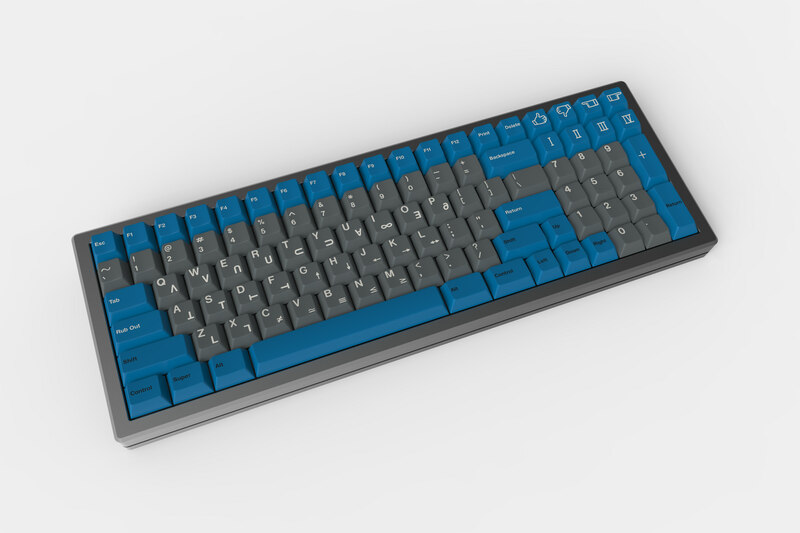 Wouldn't it feel more "original" if the modifiers were Black on Blue in the base kit ? The majority will want an all-white text kit, and I feel confident that there are enough OG supporters to get 100 units of the black rows made. Initially I had it black in the base kit, and also blue spacebars there, but IMO this represents the public demand better. Wew. I need to get this. Love that the black text modifiers are going to be an offering. Such great work here. This needs to happen. I love space cadet, cherry profile makes it an instabuy for me! Edit: upon closer examination of the first post, it seems like your planning on new molds. YESSSSS! GMK Red Samurai re-used the already paid for GMK Laser molds, so your math is wrong! About the arrows, could we forget about the space cadet layout and use the vim standard instead? His math is correct, please read again. And definetly no to the vim position. It would be nice to have those in an add-on kit, but I think it's nicer to stick closely to the source material like Oblotzky has done here. Uhm Laser/Red Samurai are japanese legends, this is APL legends. Molds can't be shared. do you ever think/read before opening your mouth and spewing bull**** ? 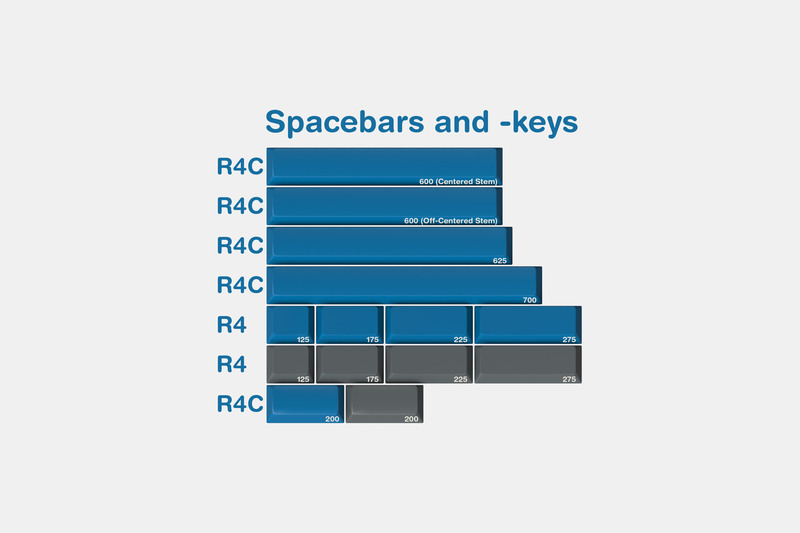 Even for a 60% layout you'd need a second Backspace, Return, 2.75u Shift and 6 more 1.25u keys... not quite sure how one more tab key would get you there? 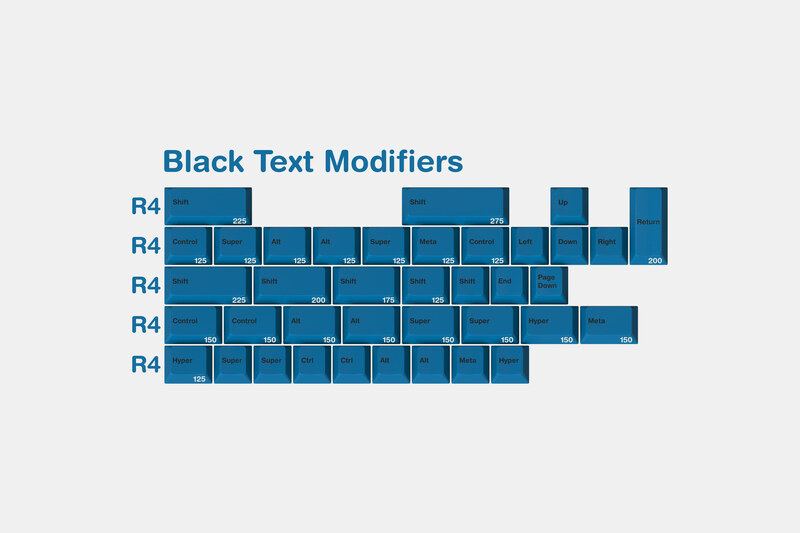 I think Blue Alphas + Black Mods would be a viable "base" alternative, but it's missing a tab key. The 150€/mold number is wrong. That is the price that has been paid because they were being re-used in the coming sets. Your price will be higher. I'm saying that a engraving into stainless steel can't magically produce something other than what it is shaped as. Do you not see the difference between the two/three? 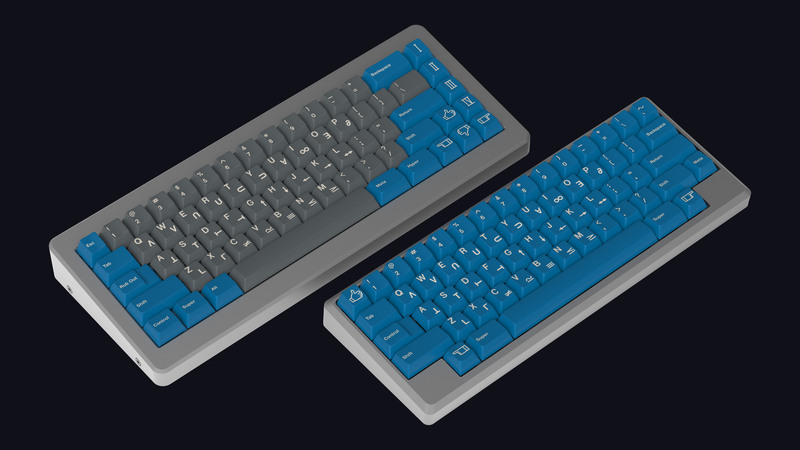 In previous cases, the molds have been shared between sets because gmk decided to invest in them. There is no IP because they haven't been paid in full by the group buy leader. If you want ip, like I said, you'll pay more than that. 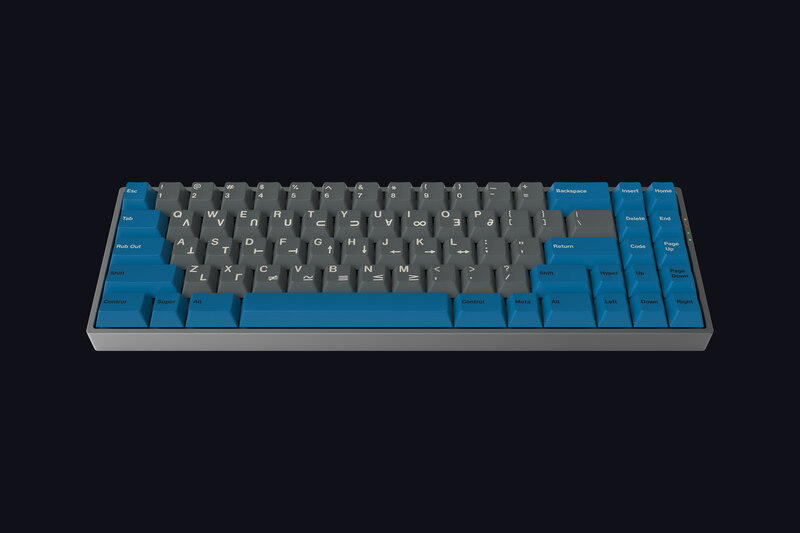 The molds have been shared between sets because gmk decided to invest in them. There is no IP because they haven't been paid in full by the group buy leader. Source? Please link something to prove the validity. I think I'm starting to get what you are on about. I'm taking Red Samurai's pricing as a basis to calculate the price for this set. But you're forgetting the fact that weeb legends in both Laser and Red Samurai are addon kits, while the base kits are regular Cherry font. I am basing my math on regular base kit + tooling cost for new legends. Red Samurai using Laser's molds only affect pricing of the child kits (Nishi and Pure Hiragana) that set offers, the price of the base set is unaffected. Due to popular demand, I will look into how I can offer Cherry-style Icon+Text mods as well. I have various ideas on how it could be done, I will investigate how it plays out with pricing. But since this is still a very young IC, don't expect an answer in the coming week or so, just note that I have heard you and will pursue options. 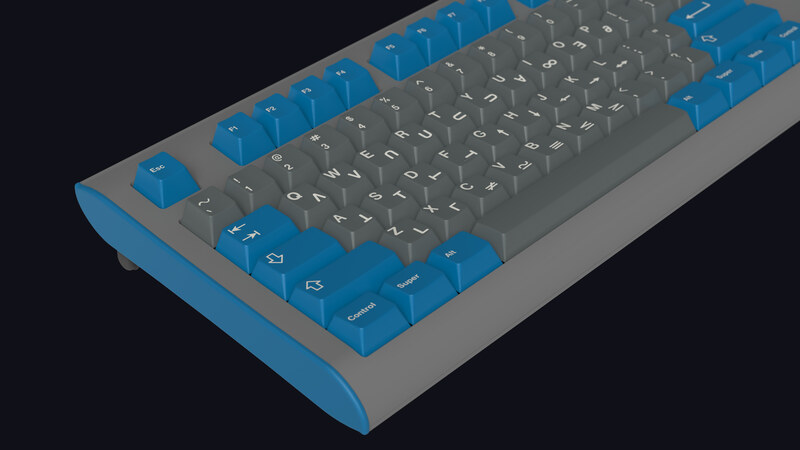 In the Massdrop forum about Redsuns GMK you'll find that the molds are shared between Laser and Redsuns set, and there are threads about gmk investing in them in the Laser forum too. This is the price as a standalone set. When made as an addon, the price will be considerably lower (at least 20% lower). Definitely in, such a nice set. Due to popular demand, I will look into how I can offer Cherry-style Icon+Text mods as well. Yes, well, that demand is coming from folks who lack a singular affinity for the original Space Cadet keyboard, and place Cherry legend conformity above the spirit of the tribute you're paying. However, you've already compromised the OG aesthetic by using corner legends, so I suppose offering Cherry-style mod legends is only one more step up that slippery slope. If you do decide to do this, I would request you put them into their own kit so the cost burden is shouldered only by those who insist on having them. 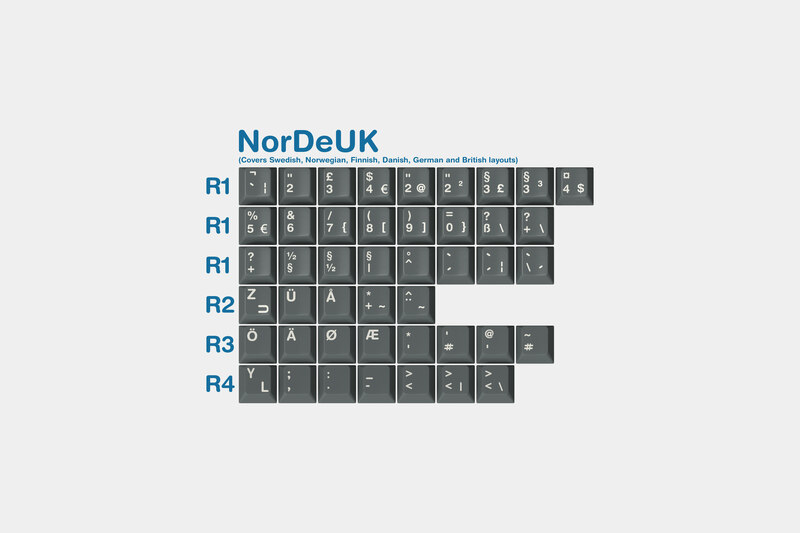 Page created in 0.188 seconds with 101 queries.